SWEET POTATO, CELERIAC AND CHORIZO SOUP. Scroll down for the recipe in English… Un potage consistant en mai? Ben oui! Par Ici, on dirait bien que le printemps nous a oubliés! C’est donc par une journée froide et pluvieuse que j’ai improvisé cette délicieuse soupe bien relevée, avec les légumes racines que j’avais au frigo. Les parfums du chorizo poêlé, du basilic frais et du Parmigiano Reggiano se marient à merveille dans cette belle et onctueuse soupe vitaminée. Verser un filet d’huile et y faire dorer les dés de chorizo dans une grande cocotte ou casserole. Retirer le chorizo et garder l’huile, maintenant bien parfumée, dans la cocotte. Y mettre les échalotes, l’ail et les feuilles de laurier et cuire pendant 4-5 minutes à feu moyen, jusqu’à tendreté des légumes. Ajouter les dés de légumes racines, ainsi qu’un peu de sel et de poivre, et faire cuire à feu moyen-doux pendant environ 20 minutes, à découvert, le temps que les légumes perdent de l’eau et concentrent leurs saveurs. Ajouter le bouillon aux légumes, couvrir, et laisser mijoter pendant 10 minutes. Ajouter le parmesan à la soupe et mixer afin d’obtenir une texture lisse (au blender ou au robot plongeur). Y ajouter de la crème et / ou du lait jusqu’à consistance désirée. Ajouter le basilic haché à la dernière minute. Goûter et rectifier l’assaisonnement. Servir chaud et garnir d’un filet d’huile d’olive, de lardons de chorizo, de basilic frais et d’une pincée de pimenton. Bon appétit! You are probably wondering why I chose to share this winter vegetable soup in May? Because it is freezing up here! Today was a cold and rainy day, so I improvised a recipe with the vegetables I had in the refrigerator. 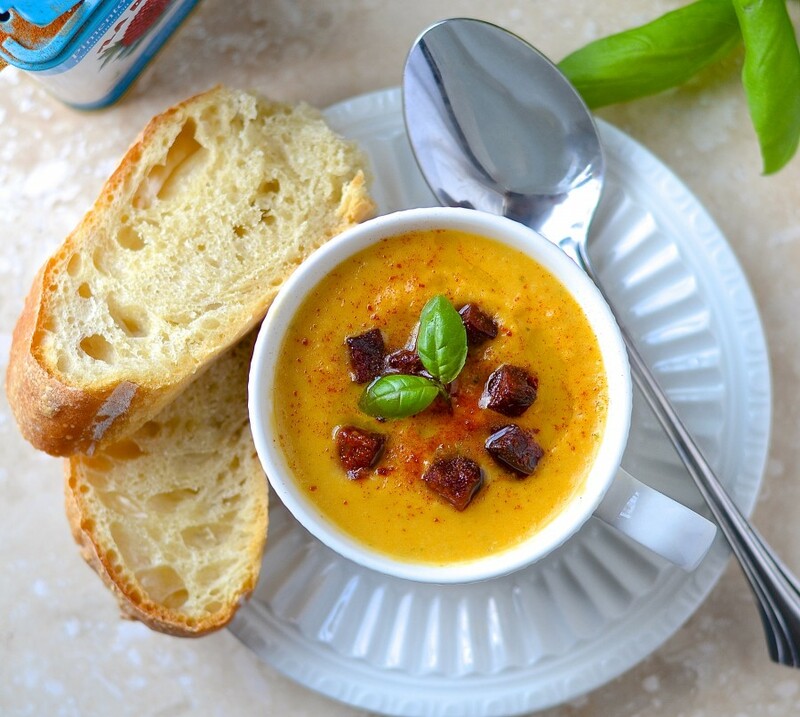 The flavours of sauteed chorizo, Parmigiano Reggiano and fresh basil were a perfect match for this creamy, vitamin-rich soup. NB: The soup was delicious with homemade no knead bread… Recipe coming soon! Serve hot and garnish with a drizzle of olive oil, some diced chorizo, fresh chopped basil, and a touch of smoked paprika. Bon appétit! Merci pour votre commentaire, ça fait plaisir! Oh, the soup looks so tasty and I like all falvours in it. I should try it (haven’t tried sweet potato in a soup)! Ce potage me tente énormément !! I love the freshness that celeriac gives a soup. This looks wonderful. Thank you Michelle! By the way, have you ever heard about Fiesta Friday? It is a weekly virtual party between bloggers (you don’t have to participate every week), started by Angie, The Novice Gardener. Many bloggers participate and I am co-hosting the first Fiesta Friday challenge, which is to create a recipe using both yeast and herbs. If you are interested, please read my post « Fiesta Friday Challenge #1 » for details (the challenge ends on May 25). Have a good day! Thanks! I’ll look into. We’re getting ready to leave on vacation so we probably won’t make this one, but look forward to another challenge in the future. Dear Catherine, I love all the flavors in this soup. Visiting your blog always makes me want to learn French! I’ve found chorizo to be so useful — with shellfish, with cheese in a charcuterie presentation, on toast. Such an intense smoky flavor. I bet the celery root mellows the sweetness of the sweet potato in this soup, too. Thank you for bringing it to the party! This is the second recipe With sweet potatoe I came across this week. Maybe I should get over it and try my first sweet potatoe recipe. It sure looks like it! Mademoiselle, I am not the biggest fan of sweet potatoes , especially when recipes add some sugar to this already very sweet vegetable… The celeriac makes all the difference in this soup. wow, looks amazing! beautiful presentation! not just in the winter but any time! I’ve never put chorizo with it, but that is such a great idea. Thank you, Catherine – and I do hope that your weather warms up soon! Catherine – J’aime ca beaucoup! I collected my vegetable box earlier and it has a celeriac in it as well as some pumpkin – I have some cooking chorizo and basil in the fridge – I am so making this tomorrow! From what I can see of your pimenton, I think it is the same brand that Jamie Oliver raves about. Lovely recipe, perfect for the party and such gorgeous photos too! 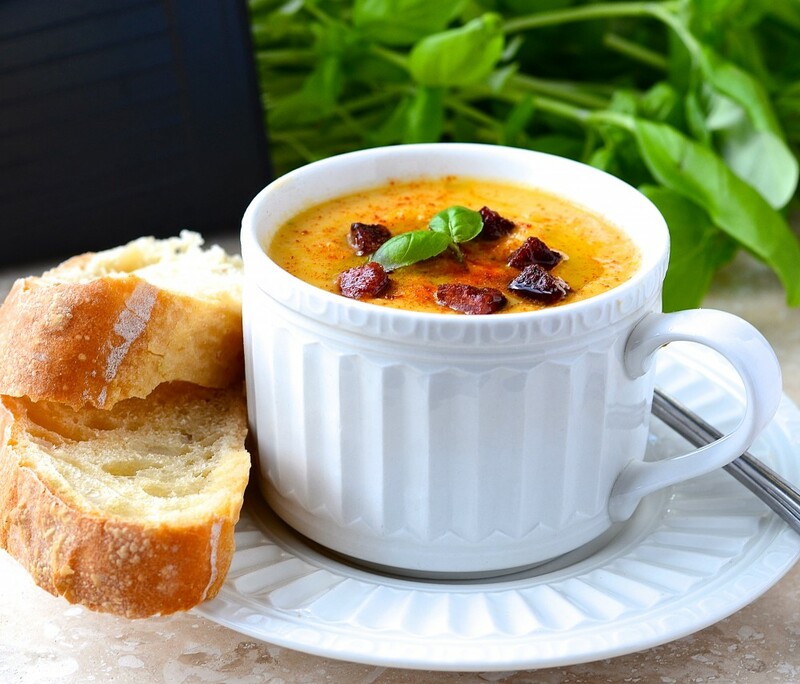 This is simply a gorgeous soup… love the chorizo addition! Hello Catherine. What a wonderful soup! I can’t get enough soup these days and I am going to put your recipe on the weekend « to make » list. 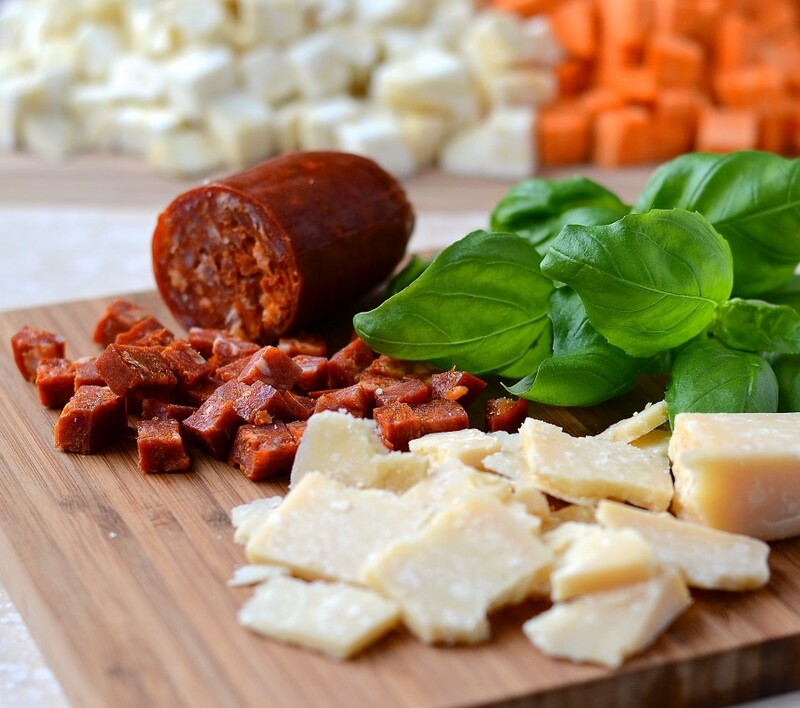 We love chorizo and what a fantastic combination. This color is stunning – and it looks delicious! I would be happy if this were on my table right now, Catherine. It is such a beautiful color and the flavors sound fabulous. Yummy! Also, I would like to thank you for coming up (together with Angie) with the idea of FFC1. It’s really amazing and taking FF to the next level. Hi Catherine! This is an amazing soup for any time of the year!! I eat so much soup, no matter the season, so this is one I will try very soon! I love chorizo!! 😀 Thanks so much for bringing this to FF! What a delicious and interesting looking soup, Catherine. I’ve never had a soup with chorizo in it before (that I can remember) and I’m thinking I’ve been missing out. Hope it warms up for you soon! Elle a l’air vraiment bonne ta soupe et la couleur est superbe 🙂 Pour t’encourager je t’envoie des petits rayons de soleil tout chaud. Passe une belle fin de semaine! No questions asked; it is a soup kind of day here too (which I will Aldo be bringing). Chorizo would be beautifully tempered by the basil; I might be tempted to add a few handfuls more. Lovely. Oh this looks absolutely delicious. Bread & soup is one of my fav things to have and this does looks super! As always- beautiful pictures, Catherine. This looks comforting and the color so pretty, Catherine! I just published my FF15 post and updated FFC1 post. I sent you an email. I hope you got it? I’ll go read it right now!